Plein aire painting in Florence is heaven. Let me be more specific: it is my husband's heaven. I prefer figure painting and still life, and for me, plein air painting in Florence is a crowded and joyless business that involves too much brown. As Daud headed out into the heat-shimmering city with field easel clanking beside him, I put on a clean frock and went to the Bargello and the Uffizi galleries for refueling at the feet of my Italian gods. 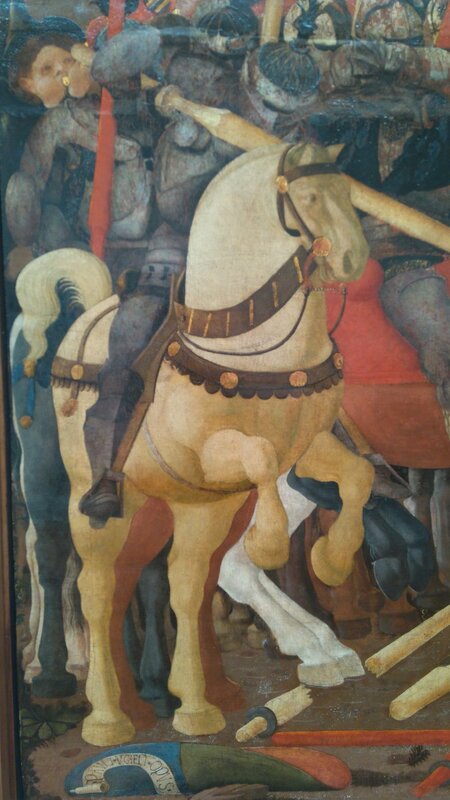 3. no pressing my body to the Paolo Uccello horses or screaming "give them to meeeeeeeeee"
Number 3 was really hard. 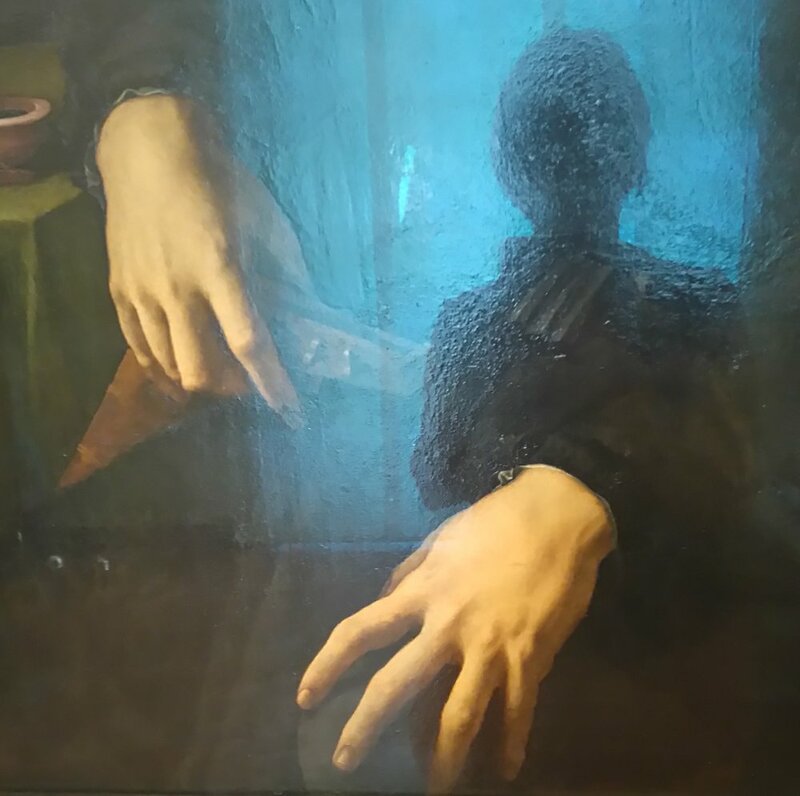 Though still digesting the tidal wave of inspiration, I rekindled my adoration of Boticelli and Bronzino, and was fascinated by hands. If you are a realist, hands can be the walk of shame. If you are highly skilled, hands tell the world what you believe: grace over reality, classical or modern, symbolic or naturalistic. In my youth one of the paintings which called me to the profession was in the Met, Sargent's Madame X. Particularly, THAT LEFT HAND. I noticed in the Uffizi that the hands of the Virgin Mary were most often patrician, stylized, graceful, highly polished. These were not the hands of a carpenter's wife, who would launder diapers at the river and cook over coals. The hands in the paintings indicated not the reality of Mary's caring for the young Christ child, but the idea of an education of grace, high ideals and beauty. Compare them with Rembrandt's hands in one of his later self-portraits. In the slide show below find a selection of my favorites from my museum wanderings, and a variety of painted hands. Let me know your thoughts on the matter if you have time. Virgin Mary's hands, nothing more elegant. Look at the spacing of the fingers, the clarity of finger structure, elegance of proportions. Look at the mischevious smile on John the Baptist child! The grace of the faces and textures. 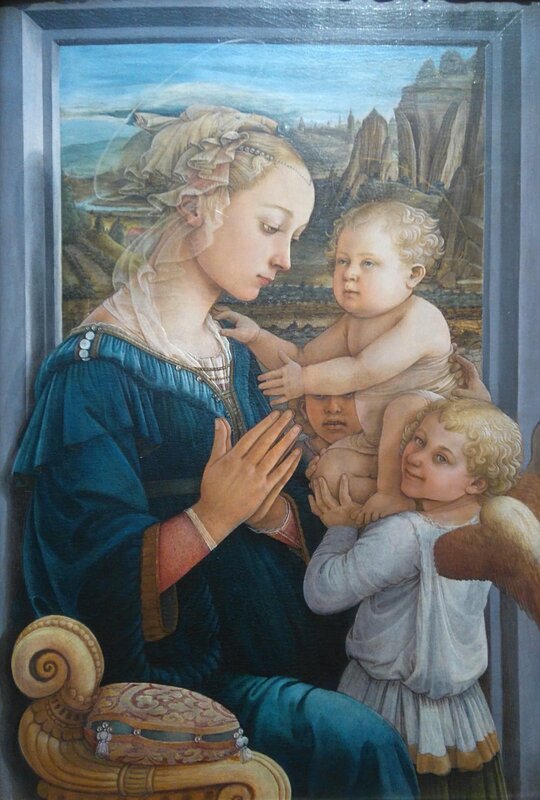 Bronzino thrills me with the childish glee. Children's hands have very different proportions. They're not just adult hands in miniature. Bacchus with raspberry hands against white skin, gorgeous of composition and structure, and in color indicating sensuality, overindulgence. Possibly, a poor worker with a farmer's tan, playing at decadence for a night. The contrasting skin color is information. In the Uffizi is a gorgeous self-portrait of elderly Rembrandt. I compare his honest and cumbersome hands to the post-Renaissance finess of Bronzino. This ceiling reminded me of the museums/palaces in St. Petersburg, Russia. Then I remembered, Italian artisans built those palaces. This painting has been meaningful to me for twenty years because it has all the animals I love (silly reason, I know, and yet...) and because of the forceful use of space. The complexity of organizing so many beings and activities in one canvas is brilliant. And the horses, they are so chubby and dear they break my heart. Never have hindquarters been so darling. While I do not want to paint in the manner of Uccello, he captured the spirit of a great horse in such a visceral way. I want to understand how to do this in my own style! His chunky, plush horses are unforgettable. 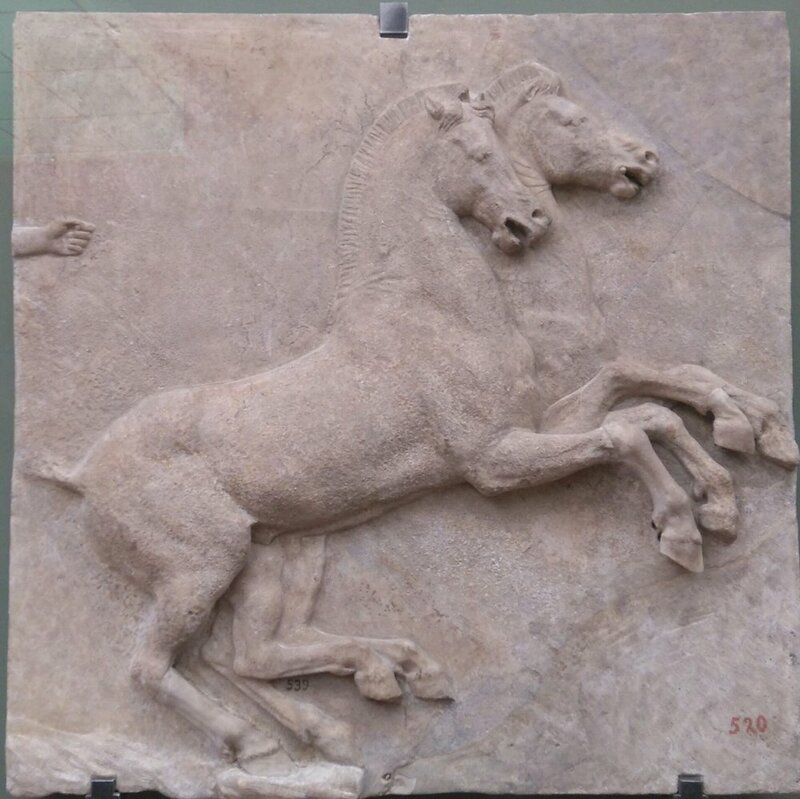 I have ordered a tile like this from my husband for our house. This painting seldom interested me in reproduction, but in life it is mesmerizing. The feminine power is palpable. And speaking of hands... Notice the dear little dog! These hands belong to my riding instructor and friend, Ismael Martin. I wanted them to be capable, agile and manly. 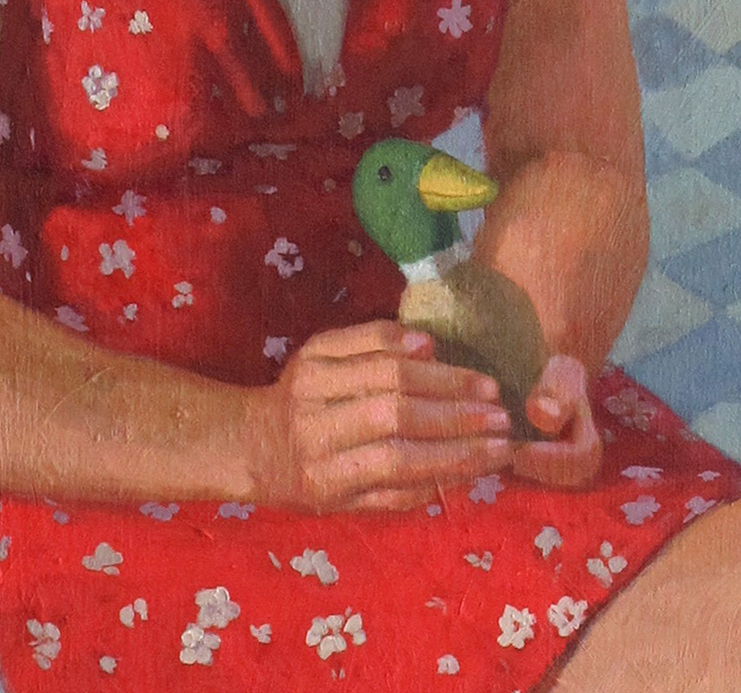 These hands belong to a thirteen-year old whose portrait I painted, and the duck was her prized possession. Her hands needed to show her protectiveness of the duck, how she cupped it keep it safe.